I’ve been trying different sources for LED lights on board since 2005 and have gone through several different types. 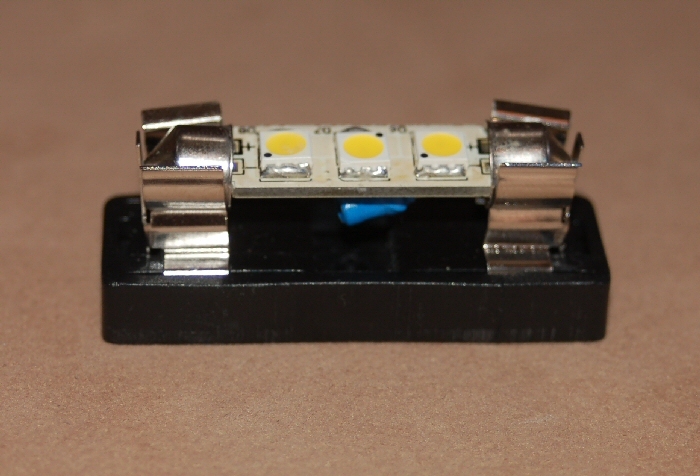 There have been several alternate sources for these LEDS but the sources seem to come and go on a regular basis. 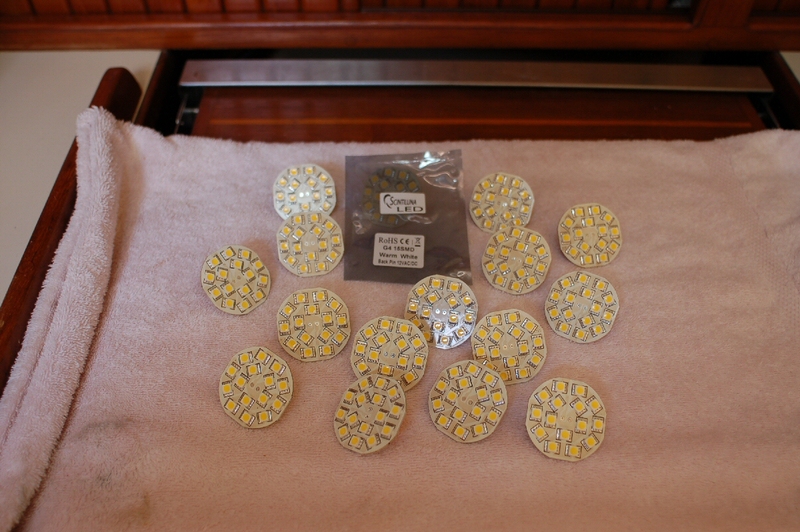 I’ve settled on LED assemblies sold by SuperBrightleds. 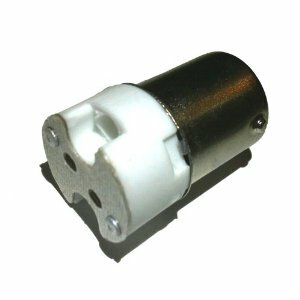 We use only those assemblies that have on board regulators so they are not polarity sensitive (important on older boats) as they seem to be flicker free, do not suffer from periodic diode burnout, and are extremely reliable. We replaced the lamps in our overhead salon lights with this style LED assembly over 3 years ago and have yet to have even one fail. 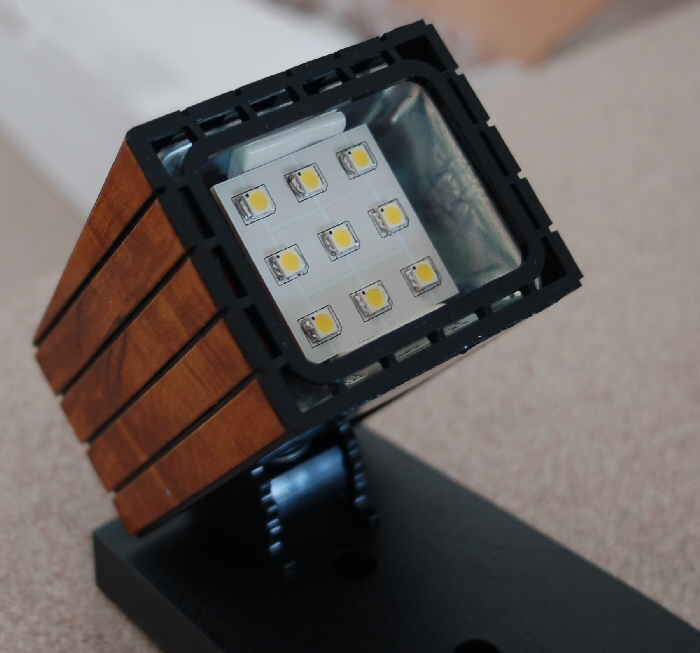 We prefer the Warm White assemblies as the light output is not harsh and has just a slight bit of yellow tint. 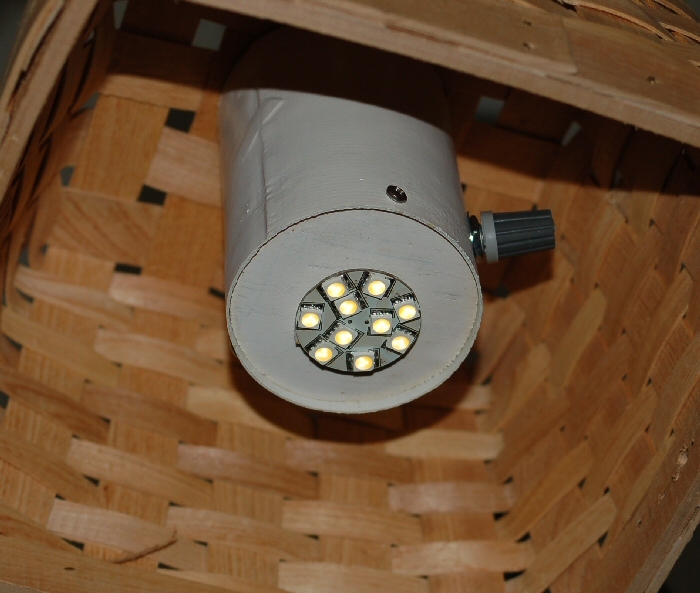 We originally used the Superbright 1156-PCB-WWHP9 assembly in our salon overhead light fixtures. Unfortunately these assemblies are no longer available as far as I know. 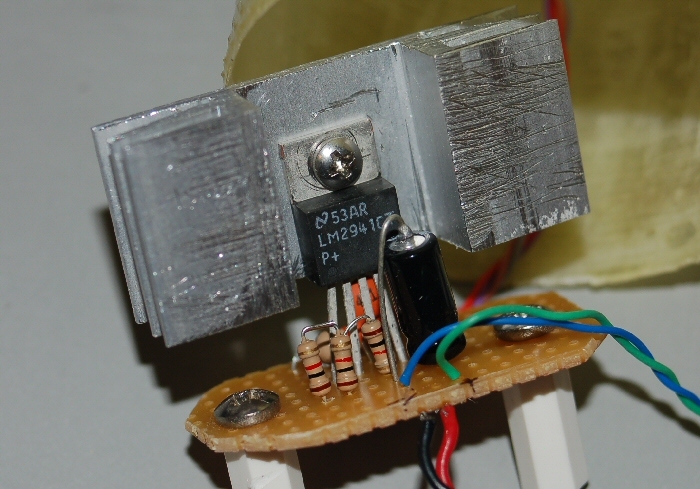 Once the electrical connection was made, I used 3 thicknesses of 3M double sided tape on the inside edges of the upper and lower portions of the fixture to hold the circuit board in place. We also used these assemblies in the small smoked white plastic fixtures under the ledges in the berths and the head. Now that the flat board LED assemblies are no longer available I’m using The Superbrightleds 40 Watt bi-pin LED With a BA15S Base adapter. 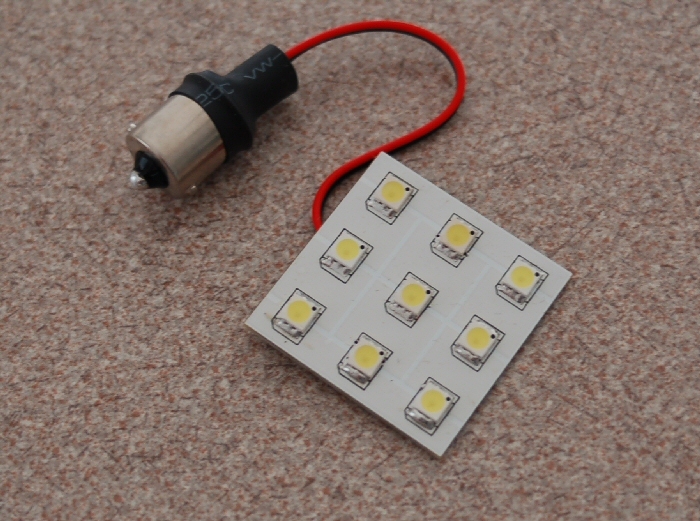 These LEDS are very easy to install. Bi-pin LEDS, available in either 25 or 40 watt versions. 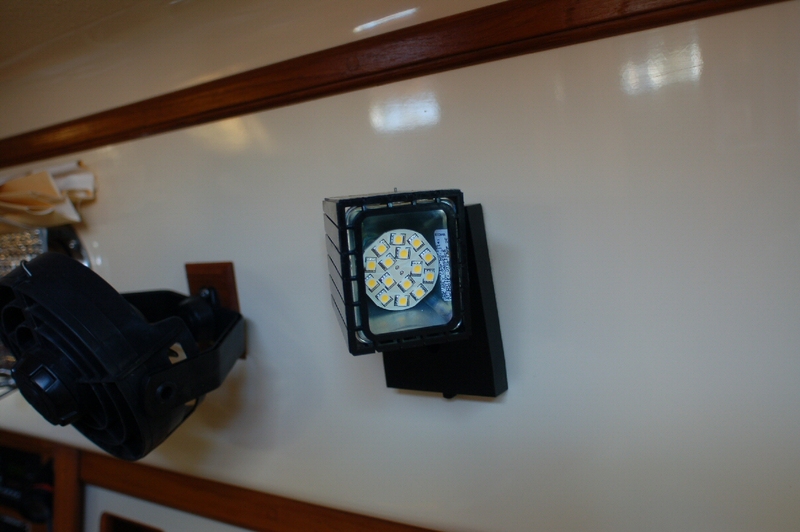 We use Festoon style LEDs and mounts, also from Superbrightleds, as replacements for the over mirror lights in the head and for behind salon cushions and under counter lighting.The Festoon mounts are screwed in behind the seat back bulkheads and wired in to the boat lighting DC power circuit. I used an automotive style rocker switch to control the seat back lighting – this switch has a red led to indicate power on – not necessary as the festoon assembly itself put out enough light that you will know when the switch is on. Taking the LED lighting one step further I fabricated a cockpit light with a dimmer that uses one of the G-4 base warm white light assemblies. The dimmer uses a small low dropout regulator chip that allows you to adjust the current (thus brightness) level. The dimmer is housed in a small fiberglass cylinder. 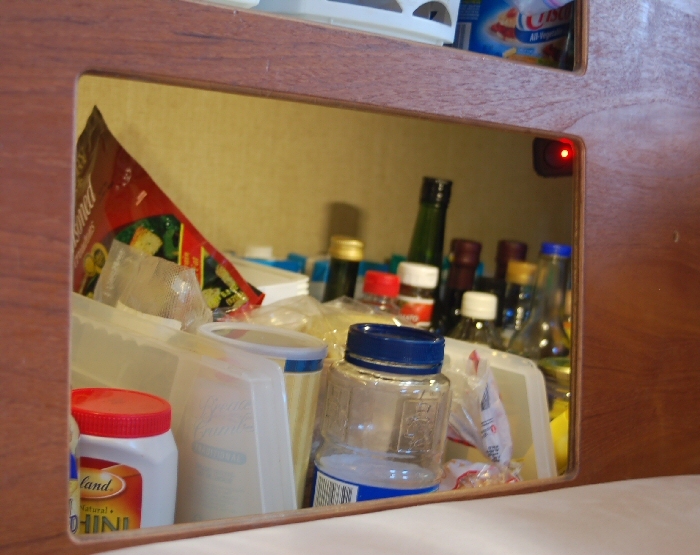 The dimmer control is visible in this photo. We now have dimmable mood lighting in the cockpit – suitable for an evening cocktail or dinner or bright enough if we want to play cards.